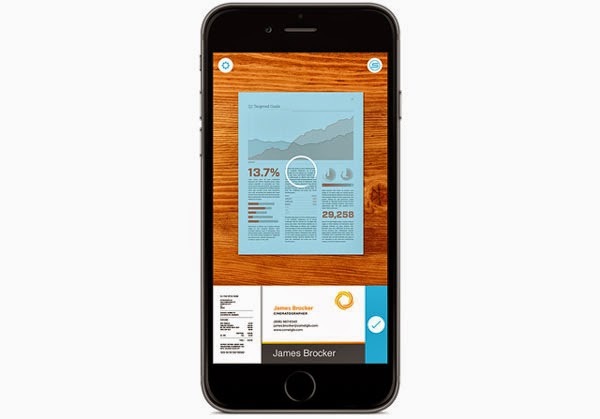 Evernote Scannable mobile scanning app launched iPhone and iPad. Available for iPhone and iPad, Scannable is designed to scan and share fast because those receipts and documents don't belong in your camera roll. Scannable is fast. Point the app at your receipt, business card, or document, and Scannable captures it. No buttons. No fussing with edges. No tweaking color. It's all automatic. Once scanned, each image is queued to a tray within the capture window, making it easy to quickly review or chain together multiple scans. Scannable is the business card wingman that knows the card is significant only because of the information it holds. While the paper is trivial, its words are full of potential. Once you connect to Evernote and LinkedIn, Scannable immediately digitizes every business card you scan. It takes that information and adds in details from your contact's LinkedIn profile, including a photo, so you'll always be able to put a face to the name. Instantly save the person to your contact list and feel free to ditch the paper entirely. Scannable is designed with your destinations in mind, so that a scan never gets stuck in your camera roll unless you want it to be. Quickly email discussion notes to all attendees right with one tap as you walk out of the meeting room, text a recipe to your friends, or save a contract to Evernote and other apps, right from Scannable. Once sent, your scan tray is cleared so that you can begin the next session with a fresh start. Scannable allows anyone in the office to simply connect the app to the ScanSnap Evernote Edition over WiFi. Scans appear right on their mobile device, streamlining the process entirely. Simply walk up, drop documents in, tap your phone, and walk away. The two pair together to provide a cheaper, faster alternative to current workplace solutions. It's the best one-two office scanning combo available, period. Check it out in the Evernote Market. Scannable is the next step in how we approach paper and productivity.